(PORTSMOUTH, VA – April 15, 2019) – The city of Portsmouth and several community organizations are recognizing NFL legend and restauranteur Roger Brown Wednesday, May 1, with a tribute banquet at 6 p.m. Before the tribute event, the celebration will begin with a small parade and pep rally in front of Roger Brown’s Sports Bar and Restaurant and a performance by the All-City Pep Band. The fanfare is followed by an evening of dinner, notable speeches, and accolades for a man who has given so much to the Portsmouth community. Organizers hope to launch a campaign that will usher the former pro football player into the National Football Hall of Fame. Brown, a native of Surry County, was a member of the Fearsome Foursome with both the Detroit Lions (1960- 66) and Los Angeles Rams (1968-69). He attended college at Maryland State (currently the University of Maryland Eastern Shore) where he earned All-American honors while being selected by the Lions. Brown was chosen to participate in the College All-Star Game which included top collegiate players against NFL Champions the Baltimore Colts. 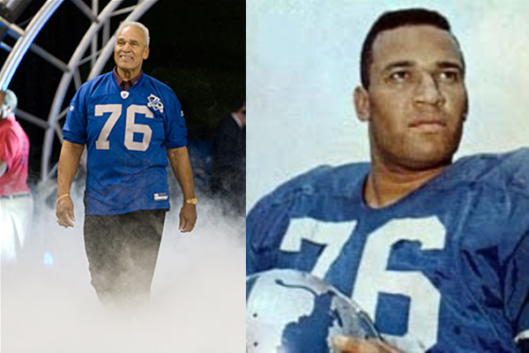 During his rookie year in 1960, Brown was selected All-Pro while finishing second in the Rookie of the Year voting. He was chosen both All-Pro and played in the Pro Bowl all six years that he played for the Lions. Brown was traded to the Los Angeles Rams in 1967 where he played four years and became part of the Fearsome Foursome along with Deacon Jones, Merlin Olsen and Lamar Lundy. While with the Rams, he was named All-Pro for three years and participated in two Pro Bowl games. Brown retired from pro football in 1970 after ten years in which he was named All-Pro nine times. Today, he still holds NFL all-time records for the most safeties in a season and most safeties in a career. Brown returned to his Virginia roots in 1991. He was inducted into the Virginia Sports Hall of Fame in 1997 and in 2010, he was honored for his collegiate accomplishments with his induction into the College Football Hall of Fame in South Bend, Indiana. Brown the businessman owns Roger Brown’s Sports Bar & Restaurant located in Olde Towne Portsmouth. On the sandwich menu you’ll find the Foursome Club Sandwich, a nod to the nickname given to the celebrated defensive lines on which he played in both Detroit and L.A. Sponsorships are still available for A Tribute to Roger Brown. All proceeds benefit the Roger Brown Foundation. For more information, contact Jenny Osborne at 757-397-8473 or email jenny@portsmouthpartnership.org. Tickets are $25 and may be purchased on Eventbrite at https://www.eventbrite.com/e/a-tribute-to-roger-browns-tickets57537667713.